After I retired from the insurance business, I discovered I didn’t like staying home all day. I found a part time job driving a school bus. The job only takes up two hours in the morning and two in the afternoon, it gets me out of the house every day and keeps me in touch with other members of the human race, and I happen to like kids. Most of them. I also make new friends among parents and teachers. 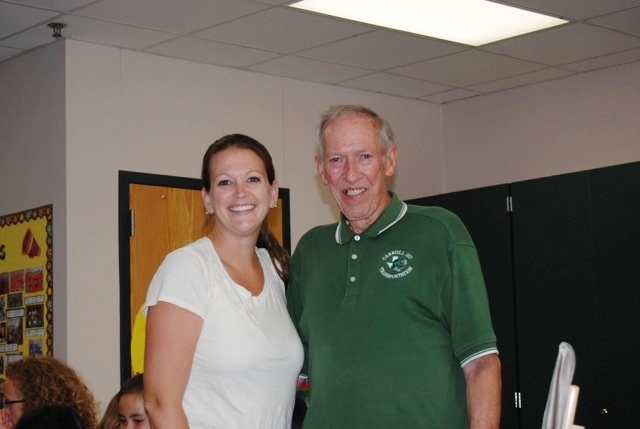 One teacher, Casey Stapp, became a good friend. Her two sons ride my bus, she read my novel MEMORY OF A MURDER, her father is a writer, and I read his book. Not only that, but when she stops for breakfast in the morning, she often brings me a sausage biscuit. Casey Stapp and me. Funny. I don’t remember my teachers being this pretty. So when Casey asked me if I would visit her class and talk about writing, I immediately said yes. Then I remembered something. She teaches Kindergarten! Now, I love talking about writing. I jump at the chance to meet with a group of readers or writers, make a presentation at a conference or seminar, or appear on a panel. I’d do it on a street corner if I could get the audience to stand still long enough. But, how in the world would I talk about writing to a room full of five-year-olds? Believe me, I worried and fretted over doing this. I wanted desperately to make it meaningful and talk to them on their level. Yes, definitely a major challenge. While I fretted and worried, I learned something interesting. At this particular school, Rockenbaugh Elementary in Southlake, Texas, all grades from Kindergarten to Fourth Grade have a class in creative writing. I’ve long worried about where the next generation of writers will come from. Most young people I know spend their time thumbing meaningless text messages on their phones with no regard for spelling, grammar or creativity. I was astounded and heartened to learn these young people were being schooled in writing. Maybe there’s hope for the future of writing after all. But back to my challenge. I knew I had to present the art and craft of writing in such a way that they would understand what I was saying and, at the same time, be entertained. I knew I had to hold their interest for twenty-five minutes, my allotted time. We’re talking about an audience with an attention span of about twenty-five seconds, if that. I knew I needed to make it interactive and get them involved both mentally and physically. So, with all that in mind, I went at it. I’m not going to repeat the entire presentation here, but here are some of the highlights. Then I asked them to do it with me. They did, but it was very soft and timid. I told them we needed to do better and asked the teacher if it would be all right if we made some noise. She said yes, so we did it again. We shook the room. They enjoyed it this time. Next, I told them I was also a writer. I held up my novel, MEMORY OF A MURDER, and pointed to my name on the cover. Then I held up my collection, SHORT STORIES OF EARL STAGGS, and pointed to my name. I did the same with two of the magazines in which my stories appeared and pointed out my name on the covers. This time, we shook the entire school. They were getting into it. After that cheer, I expected the riot squad to rush in. I gave them more examples of ways being a good writer could help them as grownups. I talked for several minutes about the importance of school because that’s where we learn all the things we need when we grow up, no matter what kind of job we do. “Without school, we would all be dummies,” I told them. Mrs. Stapp winced at the amount of noise we made that time, but she also gave me a smile. The story idea involved a hero, a princess, a bad wizard, and fire-breathing dragons. I asked for volunteers to play the parts and selected Graham to be the Mighty Warrior and Angel to be the Beautiful Princess. I played the part of Bad Earl, the Terrible Wizard. In our story, the Wizard kidnapped the Beautiful Princess and took her to his castle. The Mighty Warrior had to fight the dragons and rescue her. Everyone in the class was a member of his army, and they had fun shooting their imaginary magic bows and arrows to drive away the dragons. We made a lot of noise playing out our story, but the teacher didn’t mind. At the end, Mighty Warrior Graham had to fight Bad Earl with imaginary swords. He beat me and sent me off to jail. That brought loud “Ooohs” and “Ahhhs” from the audience. Graham grimaced and shook his head. He obviously didn’t like the idea of getting married. All the kids agreed it would be cool to reach into their imagination, find a story idea like that one, and write it. To close out my presentation, I thanked Mrs. Stapp for inviting me to come in, and we gave her a cheer. Then I thanked the class for being a terrific group. Mrs. Stapp took over at that point and led the class in a cheer for me. That, my friends, made me very happy. 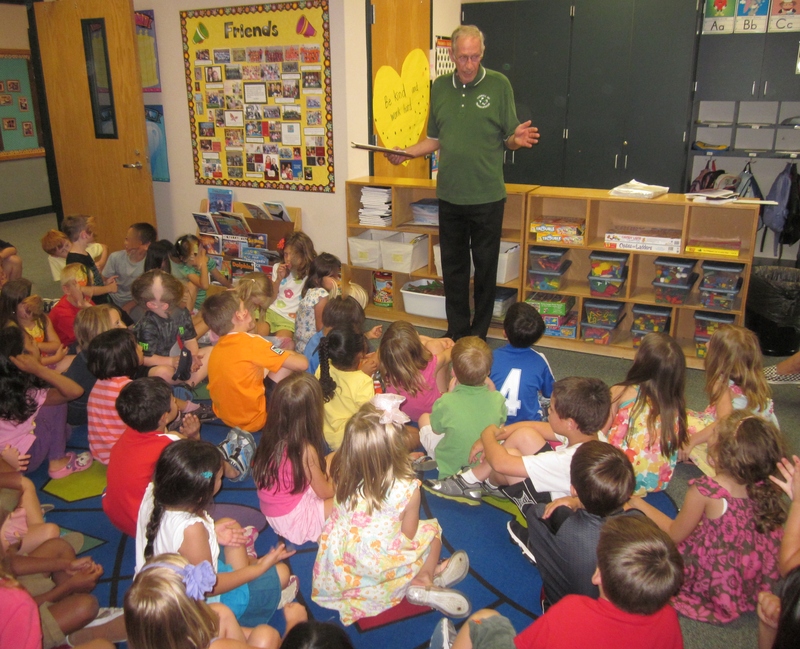 Meeting some of the Kindergarteners after it was over. And that’s how it went when I took on My Kindergarten Challenge. I hope I did okay. What do you think? All I can say, Earl, is I wish my own kindergartener son could’ve been there for your talk. He would’ve come home whooping. Sounds like you aced it, Earl! Oh, Earl! You are always so, so delightful. Earl, this is fabulous! Who woulda thunk it! What a great idea– I wish I could have Whoop Whoop Whooped the storyteller. Kids will long remember that! So will Earl–and the teacher! Super creative! Earl, this is a charming, delightful story. Good for you! Whoop! Whoop! 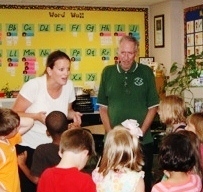 A great job, Earl, and I’m sure the kids and their teacher enjoyed it as much as you did. Good job, Mr. Earl! Bet you get invited back next year. Woop Woop for Earl! That’s the best thing you did! I’ll bet we get a bunch of new writers out of that group of kids, and it’s all thanks to you!! Not just a good job, but a great job! Since we know the kids loved it, they will remember your talk and you. Whoop, Whoop for YOU! This is adorable. Now you know what I go through. Teaching is a challenge but worth the effort. Next come my published children’s books. Thank you for this story. You did great, and the kids won’t forget. It’s amazing how receptive young ones can be. Wonderful, Earl. It appears you (and the kids) had a good time. I believe you may have inspired a whole squad of future writers/readers. Great talk, great teacher, great children, great school! A lot to “whoop” about! I love your energy and your writing. Earl, I knew you were a genius at writing (whoop, whoop, and all that) but this session with the kindergarten class is beyond genius! I am in awe. A huge THANK YOU to everyone who came by to read about my Kindergarten adventure and left a comment. I shivered with fear until we got into it, then I had a blast. Now I feel it was the most rewarding thing I’ve ever done. Again, THANK YOU THANK YOU, THANK YOU. The writing community is the most supportive group on the planet. WHOOP! WHOOP! WHOOP! FOR YOU! The worry was not about what to say about writing, but about how to say it on their level so they would understand what I was talking about. That’s like speaking in a whole nuther language. As for being a teacher, I think that’s even harder than being a writer. We can always revise what we’re working on or delete and start over again. Teachers have to work with who the parents send to them and do the best they can. I have the greatest respect for them. Do you really think I could be a coach? Okay, drop and give me fifty pushups. Kindergarten kids are smarter now than they used to be. Good job. Thank you, Ruby. Always a pleasure hearing from you. I so enjoyed reading about your kindergarten challenge! Glad you enjoyed it, Kellie. It’s still one of the favorite things I’ve done. Best regards and I’ll see you at school.